Find out how bilingual wedding invitations can help you spend less on invites, avoid mistakes and wow your guests! If you ever wondered what language to use when crafting the text for your wedding invitations, you must read this article. It can save you money, help you zoom through the mailing invitations process and have you looking amazing in the process! How can Bilingual Wedding Invitations Save you Money? First things first. Before looking cool, we want to find out how much this bilingual wedding invitations idea is going to save us. Let’s dive right into it. Printing a single set of wedding invitations can be expensive. Needless to say, having to print two sets of invitations, one in English and one in Spanish is even more costly. 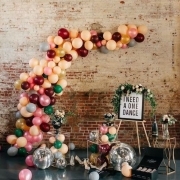 Printers always require that you order a minimum number of invitations and the higher the number of invitations requested, the lower each invitation costs. Why? All you need to know about bilingual wedding invitations. The tumbler format. 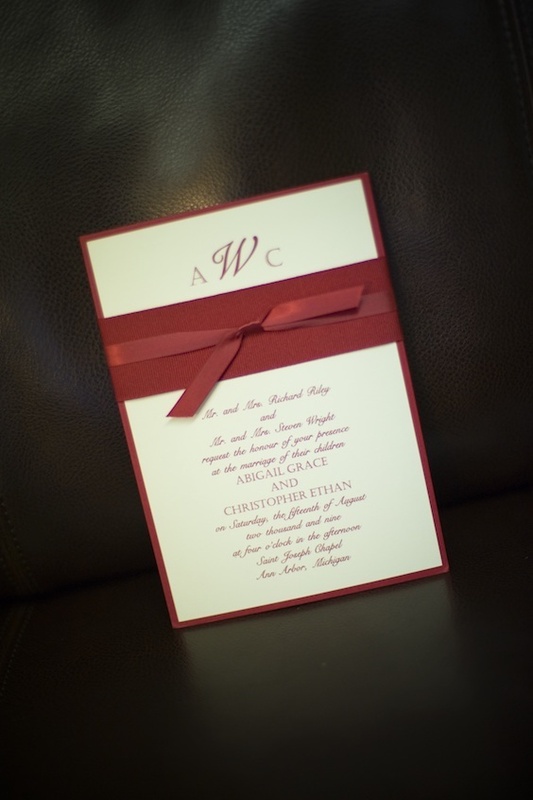 There is a setup cost associated with the personalization of your invitations. A print-run set with your information, font and color selection, cannot be used for anybody else. 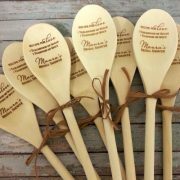 These are highly personalized items and spreading this cost over a larger quantity, makes the cost of each invite lower. Ordering two sets of invitations, one for each language, implies incurring in two different setup costs. The cost to setup the Spanish wedding invitations and the cost to setup the English ones. Bilingual wedding invitations will avoid having two setup costs and save you money! 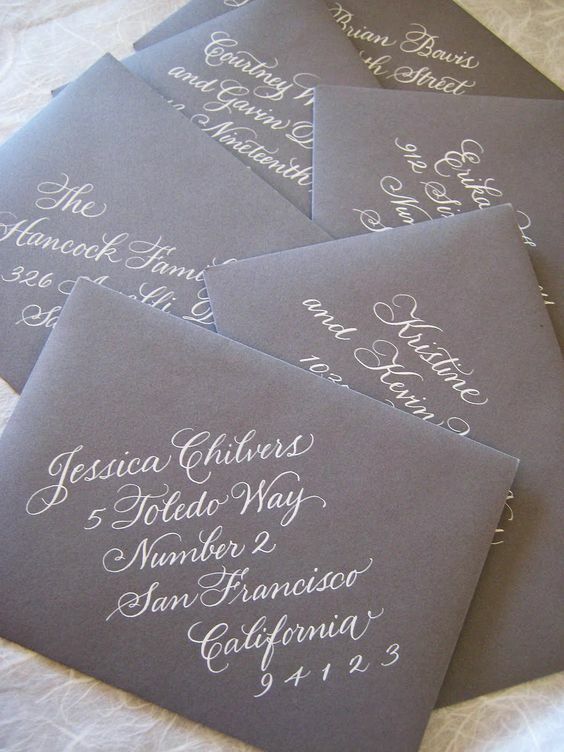 A romantic serif font mixed with soft script makes a big statement on these gorgeous wedding invitations. Black ink with a hydrangea peony envelope liner and a belly band in silver. Doing the Math: How Much Will I Save? Say 45 of which speak English, and 45 of which speak Spanish. 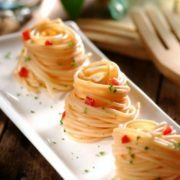 If you ordered separate invitations for both your Spanish-speaking guests, and English-speaking guests, you would need to order a total of 120 invitations (60 Spanish versed, and 60 English versed, because invitations are usually ordered in multiples of different values). Let’s assume the 60-invitation set costs $202, your total spend would be $404 for both invitation sets. If you only had to order one set of 110 invites, the same wedding invitations would cost you just $347! And you would have 20 invitations left over that you can use in your wedding album or, if you forgot to add someone to your guest list. Not bad, huh? How Else Can Bilingual Wedding Invitations Help Me? 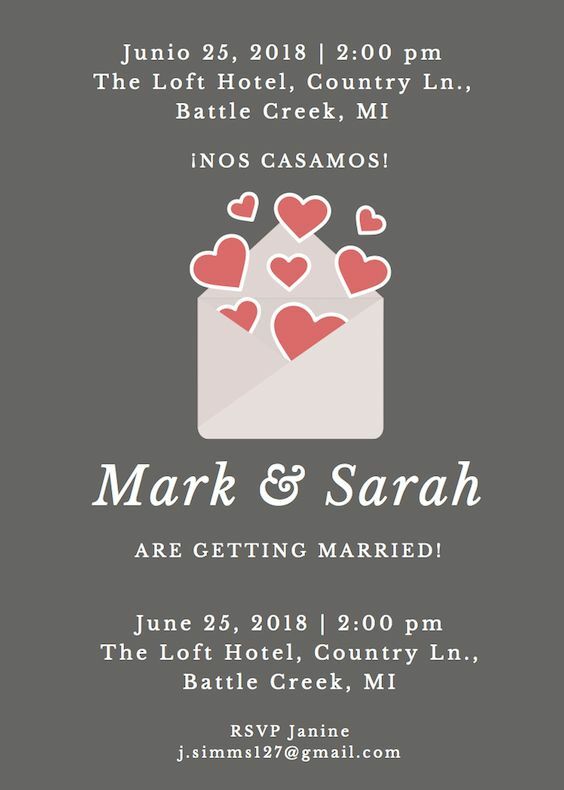 Love bilingual wedding invitations because not only will they save you money, they will help you zoom through the mailing process and avoid (costly) mistakes. 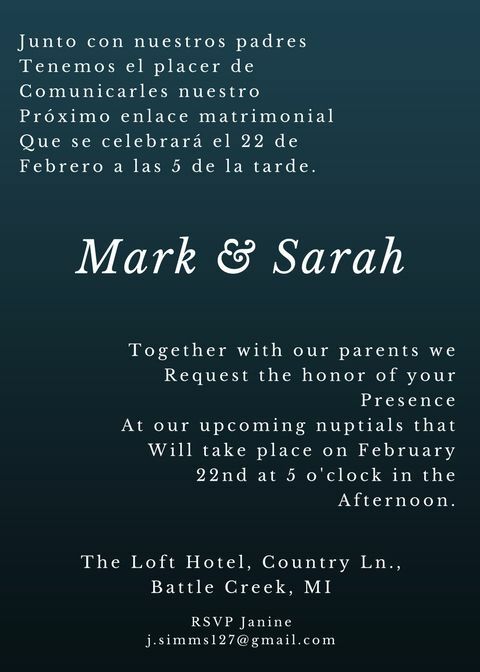 Imagine you have two sets of invitations, you will need to make sure you don’t send the English invite to a Spanish-speaking guest (or vice versa) which is more time-consuming. If you only have one set of bilingual wedding invitations, you will make no such mistake and you will definitely impress and wow your guests! 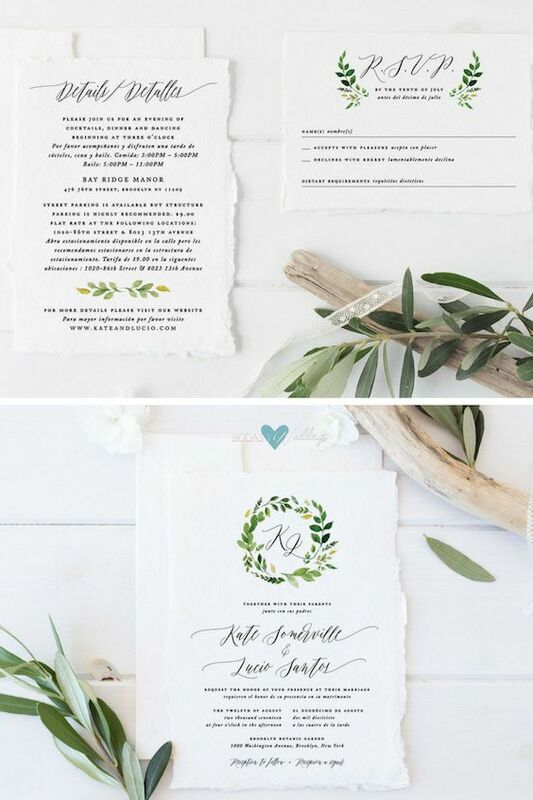 Simple and modern greenery wedding invitations. 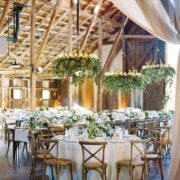 2017 wedding trends. So, What are Bilingual Wedding Invitations? 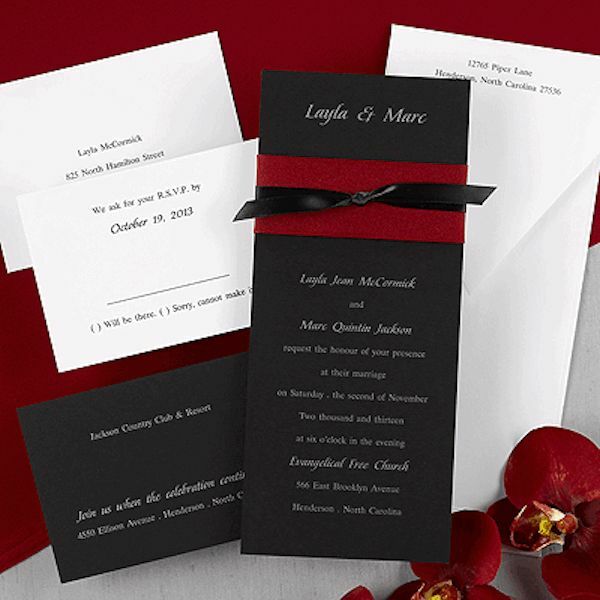 It is a special invitation layout where the information can be printed in two different languages on the same invitation at a negligible or no additional cost. How is this possible? Back in April 2008, Havi Goffan, CEO of Target Latino, created the perfect formats to print bilingual wedding invitations without having to print both sides of the invitation paper for the Celebración album. This revolutionized the world of invitations. Bilingual wedding invitations with the greenery theme. Bilingual Wedding Invitations: What Format to Pick? The answer is simple. It all depends on the invitation layout you pick. 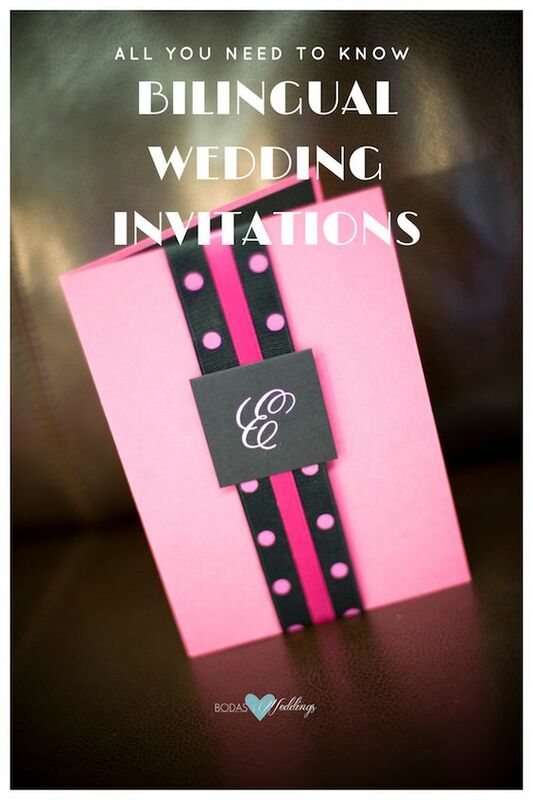 Each bilingual invitation format works best with some or several invitation layouts. Let’s check them out. When your invitation is a flat card, you can pick the “tumble” format. The information is printed in one language on one side and when you flip it over (from top to bottom) you can read the invite in the other language. It is very original looking as neither language has precedence over the other. 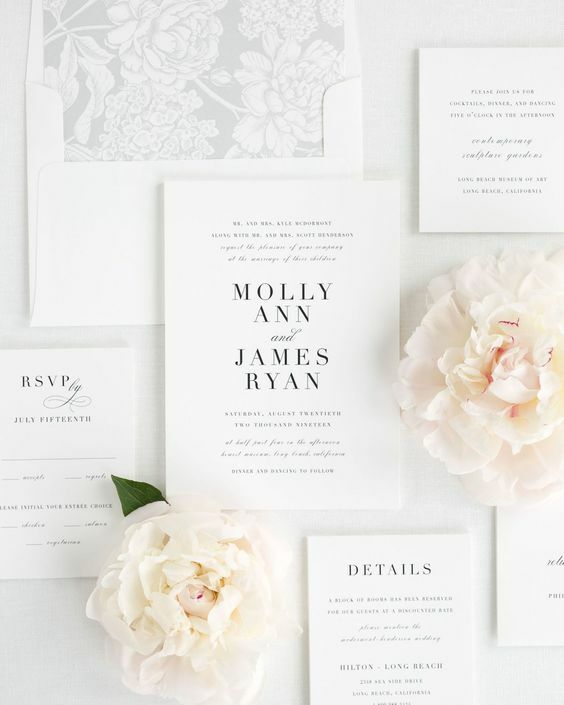 Invitations with minimal design and embellishments work best with this format. Avoid embossing, de-bossing and anything that requires adding texture to your wedding card. Some printers may charge an additional fee for this format as the paper has to be run by the presses twice. The complete guide to bilingual wedding invitations. The “Tumble” format. Both your Spanish and English versions will be printed next to each other on your invitation. You’ll want to choose an invitation that opens to a horizontal z-fold. You can have one language version on the middle panel of the invitation and on the right panel you can have the other language version. In this format the language on the main fold has precedence over the other but it works with all of the horizontal z-fold invitations. Bilingual invitation side-to-side. Delicate looking and perfect for a pocketfold. This bilingual invitation has the information printed in one language version on top of the other and the couple’s names printed just once. This format works with vertical z-fold invitations, flat cards, and gatefold invitations. Basically, every invitation imaginable! In this format the language on the top has precedence over the one on the bottom but this invitation will allow you to stay within budget and utilize letterpress, embossing and foil printing! 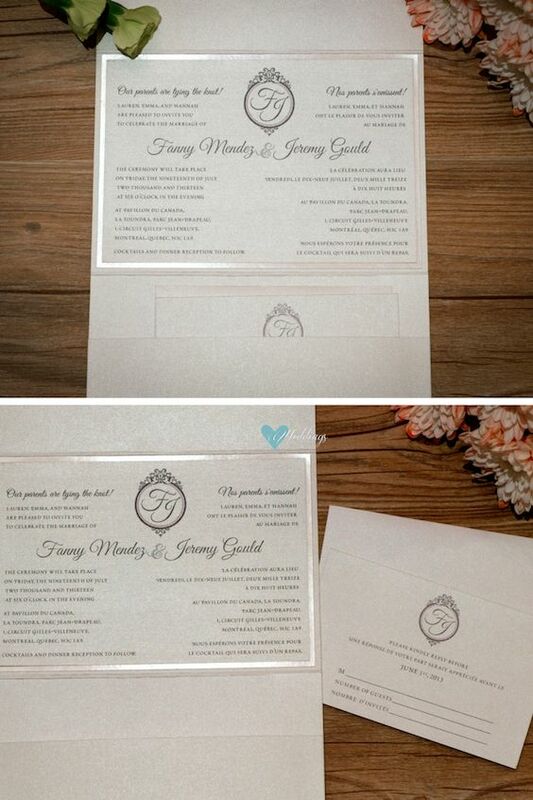 The top and bottom format for bilingual wedding invitations. This bilingual invitation has the information printed in one language version on top of the other and the couple’s names printed just once. This is the simplest of questions! 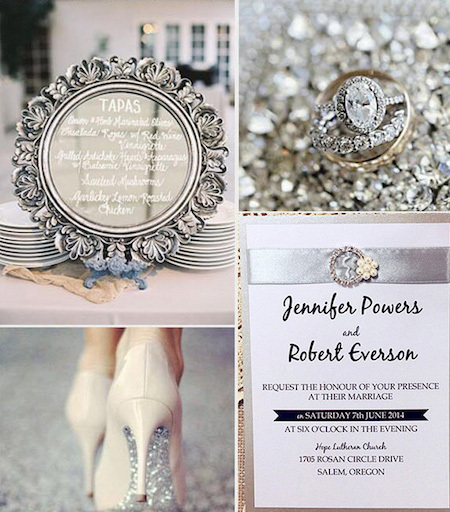 When you pick your wedding verses, think about the invitation layout and what format would best suit them. Then, all you have to do, is talk to us! 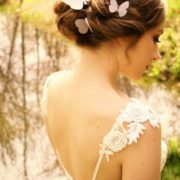 We’ll guide you through the whole process so you bilingual wedding invitations look absolutely perfect and stunning!! 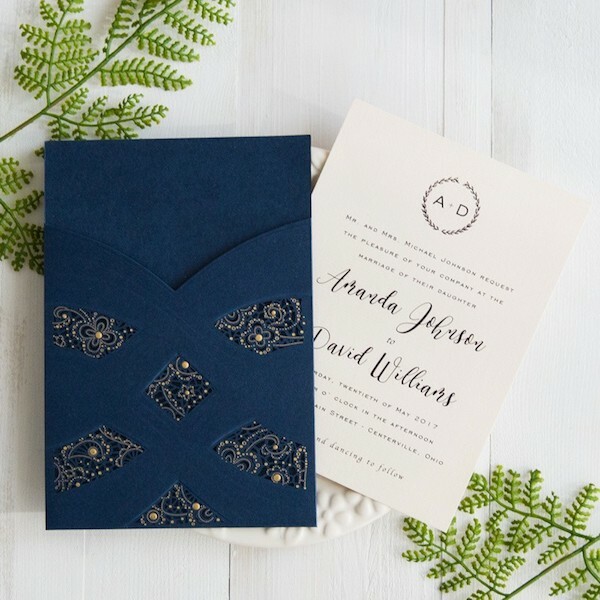 Elegant wedding invitations with navy blue and gold polka dots swirls, laser cut pockets by StylishWedd $4.50. 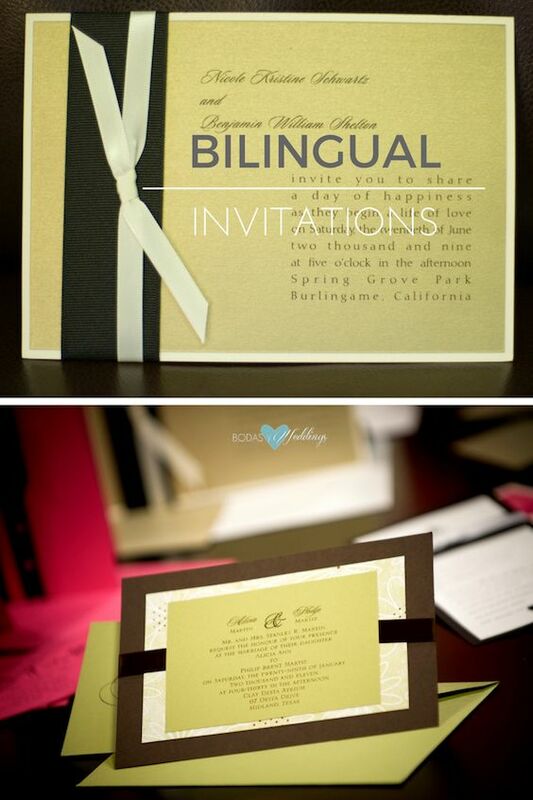 If you are inviting guests that speak two different languages, bilingual wedding invitations are just for you! 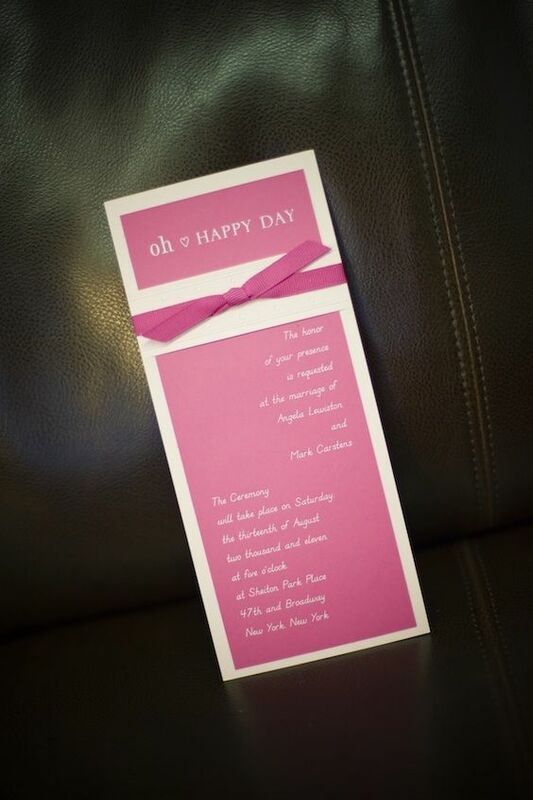 Adorable wedding invitations in fuchsia with a bow. 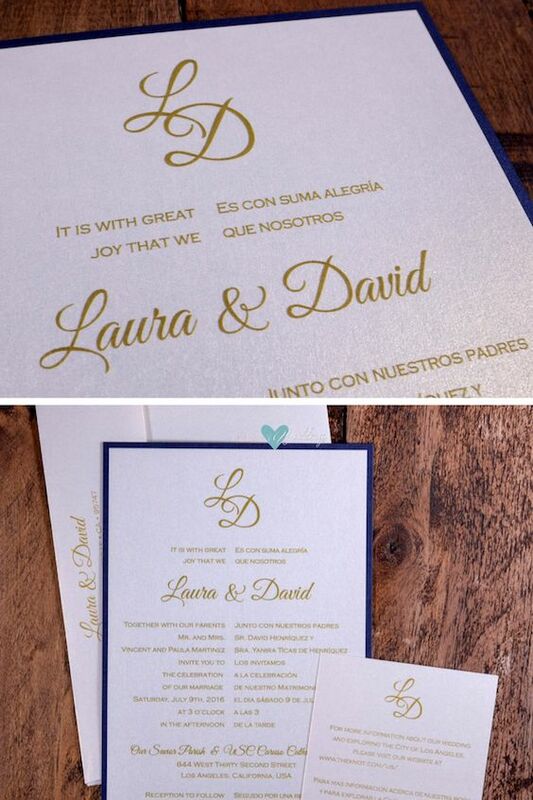 Spanish and English Wedding Invitation. 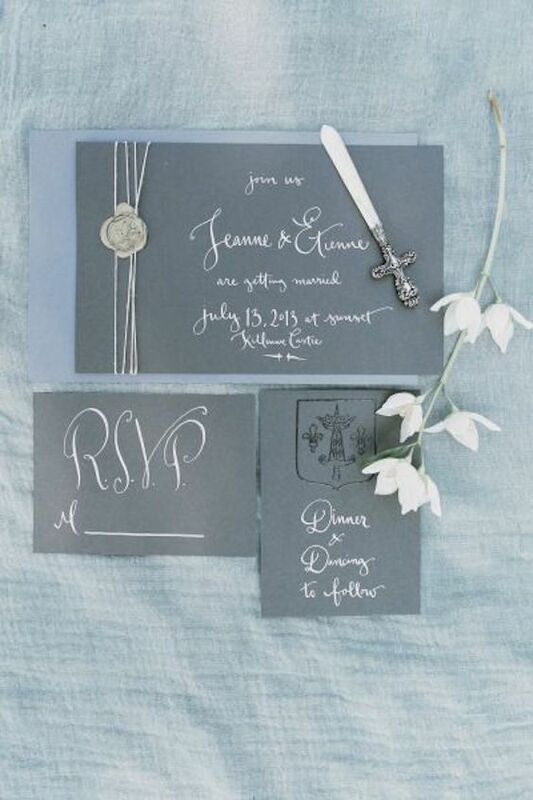 Grey invitations. 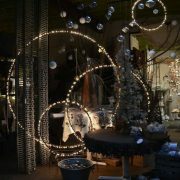 Photography: Darcy Benincosa. Easy to turn into bilingual wedding invitations. Print each fold with a different language. 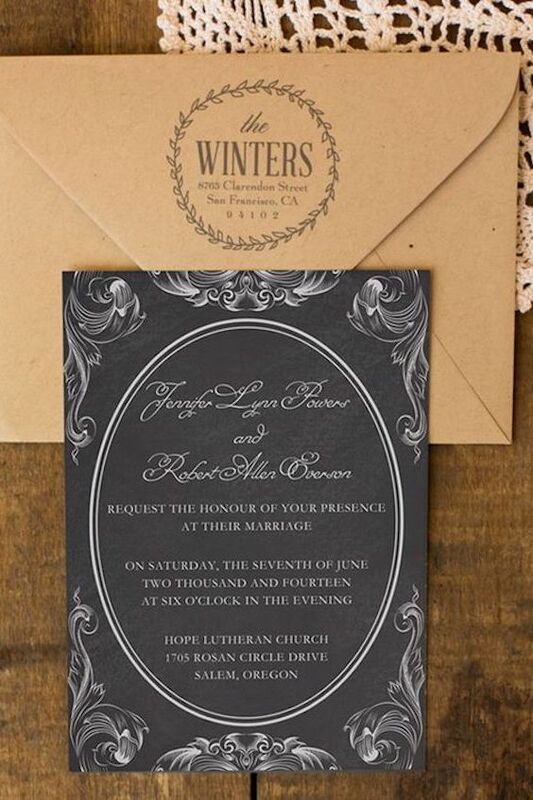 Rustic vintage white and black chalkboard wedding invitation cards. This is a great invitation layout for a top and bottom bilingual invitation format. 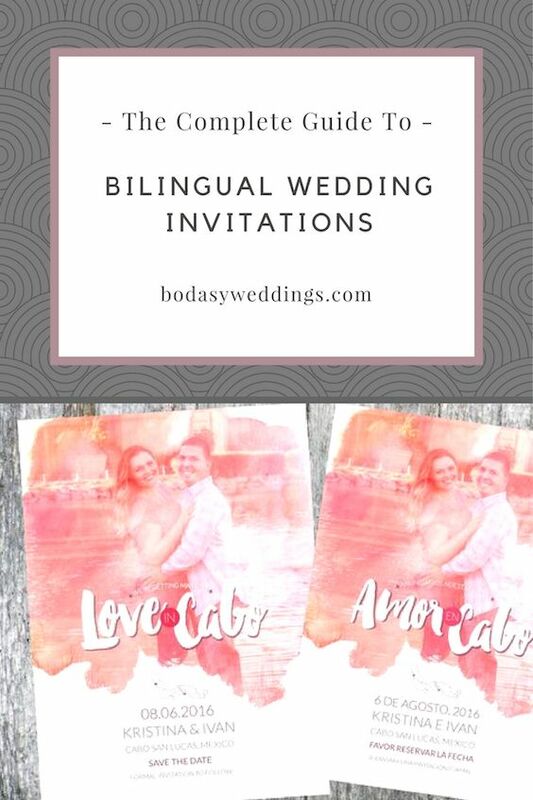 If you only have one set of bilingual wedding invitations, you will make no mistake when mailing your invites and you will definitely impress and wow your guests! Remember, if you are inviting guests that speak two different languages, then bilingual wedding invitations are just for you! Visit our Shop and order yours today! 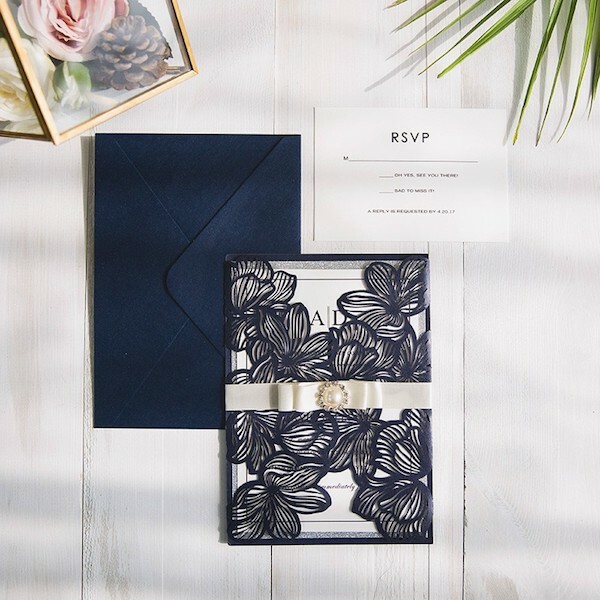 Big floral wedding invitation trends with matching envelope liners. Elegant blush and white laser cut wedding invitations. 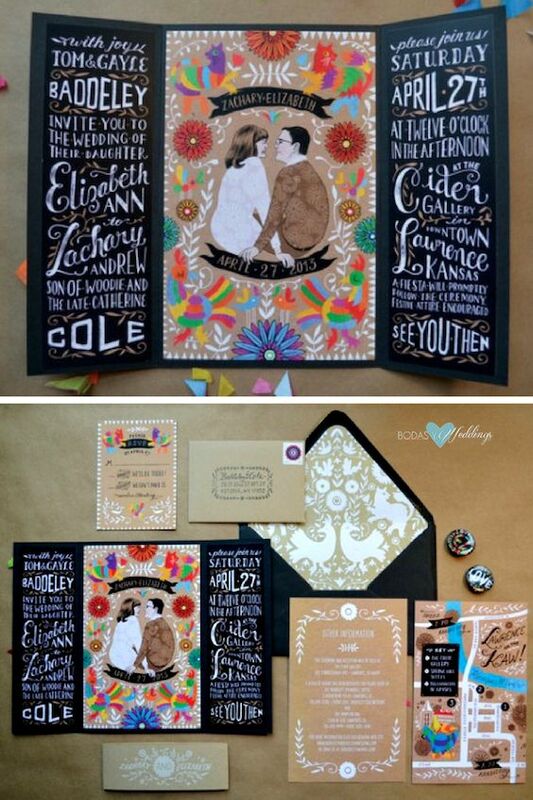 Fancy set of wedding invites by Jean M Carlson Craft. Shabby chic lace and burlap rustic wedding invitation suite. Use the tumble format to make them bilingual! You can easily add one more layer to this set and have two languages, but how much more will it cost you? Discover all about bilingual wedding invitations on the blog! Peach and grey rustic vintage lace wedding invitations.